Software de edición profesional para los amantes de vídeo y audio. 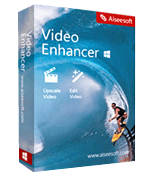 Aiseesoft Video Enhancer es el software de edición profesional para los amantes de vídeo y audio. Le permite llevar y combinar audio y vídeo libremente para hacer las colecciones de música o vídeo. También soporta rotar, recortar, marca de agua, la configuración 3D permiten editar y efectos para crear sus propios vídeos para ver y compartir fácilmente. Lo más importante, la herramienta de mejora increíble le proporciona la manera de cómo mejorar la calidad de vídeo. 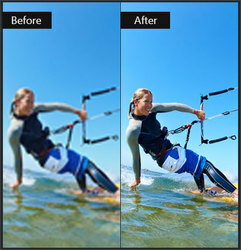 Resolución de lujo de SD a HD, incluso 4K; Optimizar el brillo y el contraste Activa automáticamente las manos frescas para ajustar los efectos de vídeo con facilidad; La eliminación de ruido de vídeo le permite deshacerse de las manchas sucio como en la pantalla, y la reducción de vídeo agitación garantiza que el video estable. Aiseesoft Video Converter Ultimate is the most professional multifunctional video utility. It converts video to other format (MP4, MOV, AVI, MKV, FLV, etc.). It also supports converting video resolution among 4K, HD and SD to meet your needs. This program also downloads hot videos from video-shared websites ( Yahoo, Facebook, etc.). Now get it with 50% OFF Coupon: AISESUOD for all GOTD users. 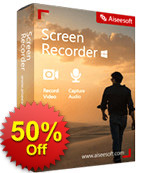 Aiseesoft Screen Recorder is an easy-to-use screen recorder. It allows you to record online video and audio with high quality. You can capture streaming videos and VOD videos to save them in your PC for playback. 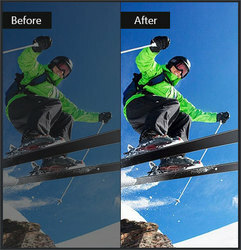 This screen recording software enables you to make your own video tutorials and record webcam videos with few clicks. Now get it with 50% OFF Coupon: AISESUOD for all GOTD users. Aiseesoft Blu-ray Player is an all-in-one player to play Blu-ray disc, Blu-ray folder, Blu-ray ISO file and other common media file smoothly. 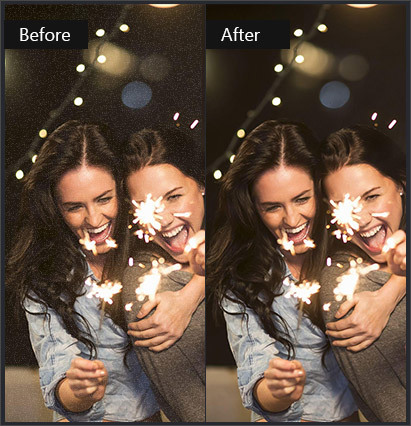 Apart from playing a full HD 1080p Blu-ray disc/folder/ISO file losslessly, it is capable to play any video format, such as MP4, MOV, M4V, TS, RM, RMVB, WMV, etc. It also facilitates you to play H.265/HEVC encoding 4K video files. Now get it with 50% OFF Coupon: AISESUOD for all GOTD users. 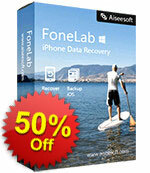 Aiseesoft FoneLab is the most reliable iPhone/iPad/iPod data recovery software. It allows you to retrieve the deleted text files (contacts, text messages, call logs, notes, etc. ), and lost media content (photos, music, videos, etc.) from iOS devices directly. Also it lets you restore iOS data from iCloud or iTunes backup. Completely compatible with iOS 10, it does a great job in backing up latest iPhone 7, iPhone SE, iPhone 6s/6s Plus, iPad Pro and iPad mini 4 on your PC. In its latest upgrade, this software adds new feature, iOS System Recovery, which enables to fix your iPhone disabled, recovery mode, DFU mode, etc. to normal for using conveniently. Now get it with 50% OFF Coupon: AISESUOD for all GOTD users. 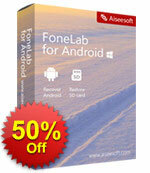 Aiseesoft FoneLab for Android is one of the best Android data recovery tool. It allows you to recover deleted data (text messages, contacts, call logs, photos, music, videos, audio, WhatsApp data, and documents) from Samsung, HTC, LG, Huawei, Sony, Sharp, Windows phone, and Android tablet or SD card. In the latest upgrade, FoneLab for Android supports fixing your frozen, soft brick, password-forgot, not-responsive, black screen phone to normal. After the fixing, you can extract the data from your broken phone and back up on PC. Now get it with 50% OFF Coupon: AISESUOD for all GOTD users.